Klingons are one of the most iconic Star Trek alien races. In 51 years they’ve evolved from deceptive villains to honorable allies—and now, with the arrival of Star Trek: Discovery this week, they’re becoming spiritual warriors once again, at odds with our heroes. Here’s everything you need to know about the past, present, and future of Qo’noS’s finest. From Left to Right: The Klingons in the original Star Trek, the Klingons in Star Trek: The Motion Picture, and Klingons as they appear in Star Trek: Discovery. 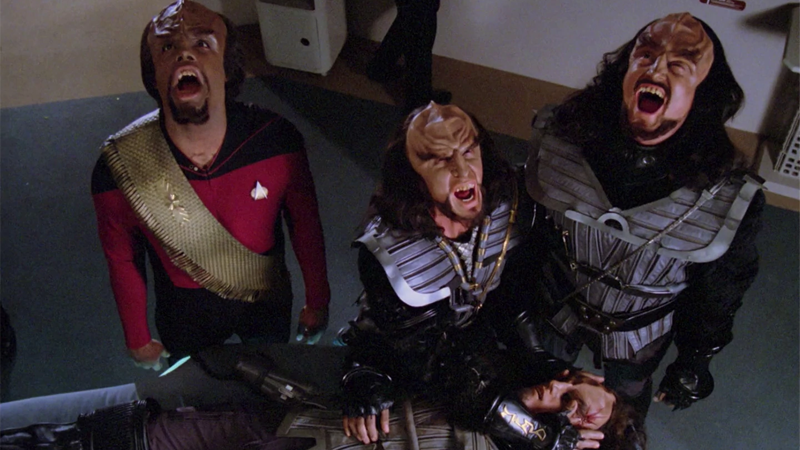 Klingons have been one of the most persistent elements of Star Trek. They made their debut on the very first season of the original show, and have since appeared on every spinoff series, including Discovery—and in most of the Trek movies, as well. The Klingons first met by Kirk and his crew in “Errand of Mercy” back in 1967 were very different from the Klingons we know today, both in their physical appearance and in their characterization. Intended as a Soviet parallel to the Federation’s US, the original Klingons were treated as inferior to the Federation’s ideals in every manner. The Klingons were a crafty, savage, and warmongering race, morally corrupt and willing to do anything to get their way—especially if it meant getting the upper hand against the Federation, their long-time rivals in an interstellar cold war. That nature uncomfortably played into their appearance as well. The original Klingons were given an incredibly Orientalist aesthetic, with white actors having their faces darkened with makeup to appear more alien, plus accented eyebrows highlighted with shoe polish and matching thin mustaches. To the modern eye, the look of original Klingons is deeply problematic, but at the time, it was a huge budget saver; one of the primary reasons the Klingons became such major recurring villains in the original series was that their makeup costs were much lower compared to the prosthetics needed for the Romulans. After the Star Trek TV series came to an end, then found itself revived as a movie series in the ‘70s, there was finally a budget to make the Klingons appear truly alien—and with it came a complete overhaul of the race that changed their place in the franchise. Their new makeup work gave the Klingons long, flowing hair, sharpened teeth, and distinctive forehead ridges (more on those later), but Klingon culture was given an even greater shake-up. A new language was introduced to further emphasize the differences between the Klingon Empire and the Federation, and, taking inspiration from feudal Japan, Klingons became a species that valued honor above all else, holding strictly defined traditions around the art of war that formed the cornerstones of Klingon society. Worf and B’Elanna: Two characters who would find themselves stuck between the different societies of the Federation and the Klingon Empire. Although original Trek creator Gene Roddenberry was hesitant to bring back old aliens when Star Trek returned to TV with The Next Generation, set a century after the original show, the Klingons ultimately became a fundamental part of the series in the form of Michael Dorn’s Worf, a Klingon member of Starfleet and one of the show’s primary characters. Representing a time period when the relationship between the Federation and the Klingon Empire had become relatively amicable, Worf became a lens for the audience to discover the new culture behind the Klingons first hinted at in the movies, examining both their dedication to martial prowess (with the introduction of iconic elements like the Bat’leth, the curved Klingon blade) and their spiritual side. Gone were the savages of the original series, instead replaced by a principled society of honorable warriors. By the time of Voyager and Deep Space Nine (the furthest we’ve been into Star Trek’s timeline on TV) the Klingons had become heroes. After a brief period of hostility the Klingons became crucial allies for the crew of Deep Space Nine and the Federation at large in DS9's seasons-long war with the Dominion, while Voyager examined prejudices and acceptance of the Klingons within Starfleet through B’Elanna Torres, a half-human, half-Klingon engineer troubled by the pull between her two very different cultures. Dr. Antaak, before and after being afflicted with the Augment Virus. How the Klingons grew from the mustachioed, smooth-headed humanoids of the original series to the ridged aliens of The Original Motion Picture and beyond has been a canonical puzzle Star Trek fans have theorized and debate about for decades. There was never a reason provided for the difference in either the movies or The Next Generation—it was simply declared that these new aliens were still Klingons and that was that. For years, the closest the series ever got to acknowledging the change was a one-off joke in the special Deep Space Nine anniversary episode “Trials and Tribble-ations,” which saw the crew sent back into the past to the events of the original series episode “The Trouble with Tribbles.” When asked by his colleagues why the Klingons of Kirk’s time looked so different to the Klingons they know of in the 24th century, Worf offers a brief but stern rebuttal: Klingons don’t talk about it with non-Klingons. Fans finally got an explanation for the disparity between the two kinds of Klingons nearly 40 years after their first appearance thanks to Star Trek: Enterprise, which was set in the years before the formation of the Federation. A two-part story in the show’s fourth season revealed that Klingons have actually always had forehead ridges, but a virus accidentally unleashed on the Klingon homeworld when scientists tried to augment Klingons with human DNA caused victims to develop human physical characteristics, including smooth foreheads. A treatment for the virus was developed by Enterprise’s resident medic, Dr. Phlox, but the physician theorized that it would take generations for Klingon children to be born with ridged foreheads again. It remains to be seen whether Discovery, which features pre-original series Klingons with forehead ridges, will have something to say about the bizarre evolution of the feature, given its place in Star Trek’s timeline. But we do know that the series will provide a biological reason for the ridges: they’re covered in extra-sensory receptors, to help Klingons detect and hunt their prey. Although Klingons have been established as a warrior race from the beginning (honorable or otherwise), one major element of Klingon culture introduced in their post-original Trek appearances is an emphasis on spirituality, borrowing elements from familiar mythological cultures in our own past to turn the Klingons into quasi-warrior monks. The honor-bound nature of the Klingons has led to many instances of their culture clashing with that of the Federation through a love of rituals and remembrances, especially around the act of honoring the dead. Aside from their ritualized beliefs and honor codes, Klingon spirituality includes no gods, as legendary warriors killed them thousands of years ago. There is one important figure in Klingon religion, though: Kahless, who was the first ruler of the Klingon Empire and established its honor code. Weirdly enough, by the time of The Next Generation and beyond, the Empire was once again led by Kahless... except this time it was a lab-grown clone of the original, a slightly less intimidating figure and more of a figurehead for Klingon society than an actual ruler. As Star Trek’s portrayal of Klingon culture developed, so did the need to make the race feel alien beyond the makeup-drenched actors of the original show—and part of that was the development of a whole new language for Klingons to speak in. Originally devised by Scotty himself, James Doohan, and Motion Picture producer Jon Povill as part of the film’s wide-scale re-imagining of the Klingons, the Klingon language (sometimes referred to as Klingonese) as we know it today was really developed during the making of The Search for Spock by Dr. Marc Okrand. Okrand’s work on the Klingon language flourished, not just because of his own additions to it as Star Trek continued, but through the works of fans. Shortly after The Klingon Dictionary’s release, fans started to learn and teach the rules Okrand had laid down, and groups like the Klingon Language Institute started forming in the early ‘90s to study the entirely fictional language. In the years since, translations of famous texts have been made available in Klingon—from Bible passages, to the epic Gilgamesh, to Shakespearian plays (inspired by the line from Star Trek VI: The Undiscovered Country, “You have not experienced Shakespeare until you have read him in the original Klingon”), as well as an entire opera performed in the language, ‘u’, all done by ardent fans. Klingons are one of Star Trek’s most enduring features—their reliable presence across 51 years of the franchise is as defining as their ability to change each time we meet them. Whether it’s in big ways or small, change is fundamental to the Klingons, from the mustachioed brutes of the original series, to the dominating, brutal, and alarmingly spiky armored hunters we’re about to meet in Star Trek: Discovery. No matter how many times they show up, it’s always guaranteed that there’s always going to be something new to learn about them.